Language corresponding events was a feature we have added since eventON version 2.5.4. 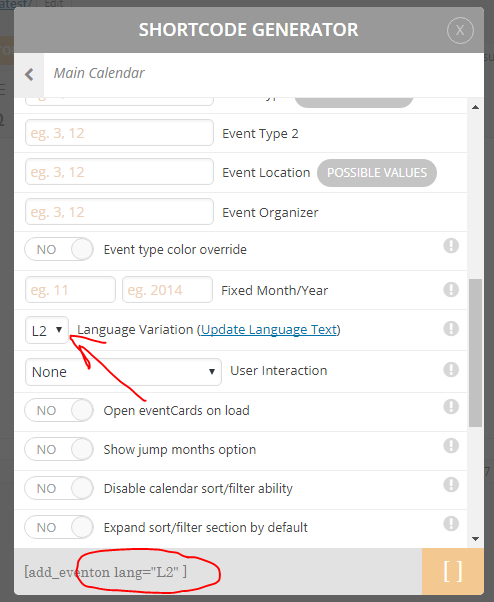 This feature allow you to keep all your events (from multiple languages ) in one place and show only certain events from certain languages in a calendar. From EventON settings > General you can enable language corresponding events. Once enabled in settings go to each event edit page and you will see a new box as below. This will allow you to select the corresponding language for the given event. Eg. if you create a new event called “Christmas Party” in english and your L1 is English you send L1 under here. Similarly you would select L2 etc. for other languages that you can decide on. These languages are not set, but rather differentiates based on the L1, L2 values. Therefore you can use these classifications for any language you want. Another great aspect of this is, when you use lang=”L2″ etc in the shortcode it will also convert the rest of the calendar text content to corresponding language values set via eventon settings > language.